I am happy to say that I am finally dining at Alinea Restaurant. Woohoo! 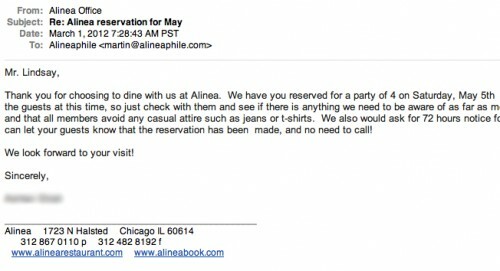 We will be in Chicago for the National Restaurant Association show, and secured reservations for Alinea. So excited! It’s an anniversary celebration, of sorts: I’m now half-way through the Alinea Cookbook! i will be in chicago for Next and Schwa that same week! im sure we will both have some great pictures to post that week! i saw the lamb dish they are currently doing… wont ruin anything for you… just excited for you! have fun! Thanks, you too. We plan on getting in as much fun as possible!